After a large purchase, like a home or car, do you find yourself asking, "why this one?" I've been doing that over the past week. Why, out of all the houses out there, did we choose this house? ....when I really loved this one? These two houses are nothing alike, but I fell in love with both of them. There were several reasons why the house we are buying appealed to us. It had most of the items on our "checklist" and a few things we didn't expect. It is in a good location and the Nashville area is growing, which means the resale value should be pretty good if/when we need to move again. The hubster's business finds us somewhere new every few years. We will be working with a blank slate...no one has lived in this house, so we will be able to make the few changes we want to make relatively easy. I don't like to be closed off in the kitchen when we have guests...I love to entertain! This house is much smaller than the one we are renting and we both wanted smaller. I don't like to spend all of my free time cleaning a house, especially one with empty rooms! 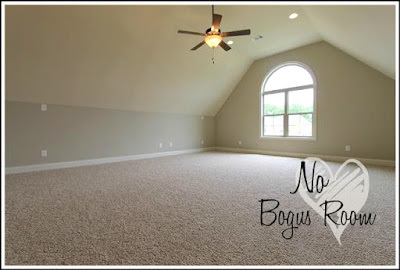 This house does not have a "Bogus Room"...it is a true "Bonus"! 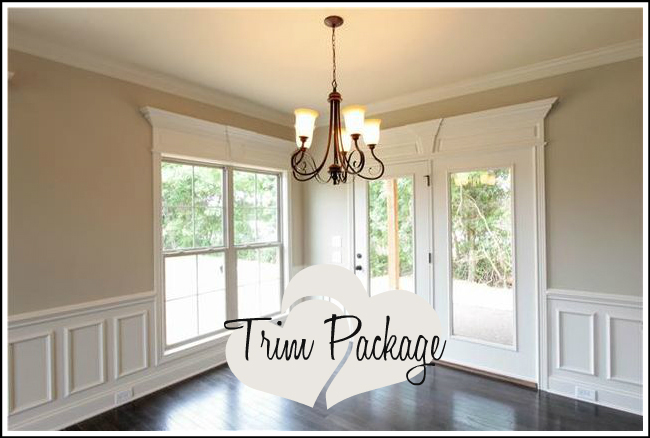 The wainscoting and trim package add a little elegance to an ordinary house. While I really wanted white cabinets, these were very appealing in color and style. The house does have some negatives....no screened in porch and an extraordinarily small back yard. We are correcting that problem before we move in..the screened in porch, we are stuck with a small back yard. Builder incentives were a huge perk on this house. We are getting $$$ from the builder on closing costs and that was HUGE for us!! Glad you found a house and I can see why you love it! 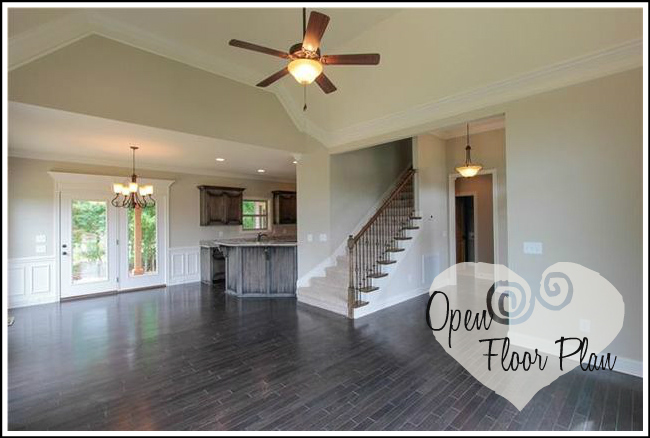 the trim details are nice and so are the floors! 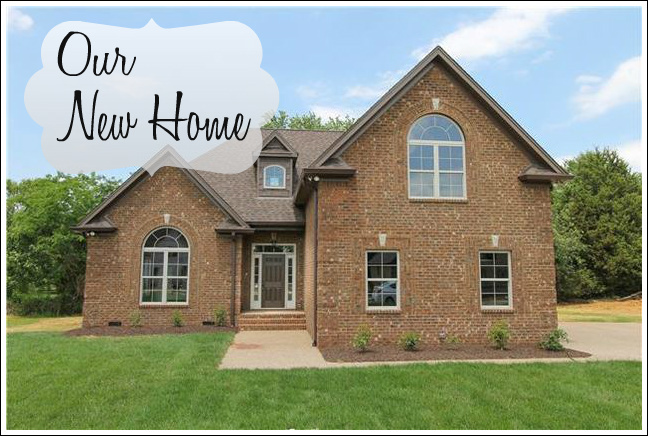 Can't wait to see how you make a "Benita" home! I, a lover of painted cabinets...especially white, think those cabinets are wonderful! Can't wait to see it dressed up. The trim work would've sold me on the house. And I can tell you a small backyard would be a selling point for me. We went from an acre of land to a third acre corner lot and it just needs mowing and watering all the time. Next house will not have very much to mow, for sure! So glad you popped into my blog. Now I will be able to watch, as you go along with making this clean-slate, into just what you want!!!! Which will be great fun for you. And also great fun, for Dear Readers like me. Tessa, thank you so much for popping over! And yes, there was a little gut instinct that this was our house...LOL. We liked the little extras and those definitely outweighed the few negatives of this house. I hope it will be fun...I've told some of the others that I may be depending on their help in decorating this house. This will be a first "brand new" house for me and it is intimidating. :-) Hugs!! Screened in back porch.... Sooooo perfect! Yes ma'am...that screened in porch was a "must" on the checklist. :-) The hubster loves having his outdoor space and his little pleasures!! :-) Hugs! Hurry, hurry and decorate it! I want to see it all done! Love the wainscoting and trim and fireplace. The windows are pretty too. Love your house. Looking forward to seeing how you decorate. Let the fun begin. Have a good week. Thanks so much sweetie! We are ready to get started on everything. This will be a new challenge for me, that's for sure! Have a great rest of the week! It is gorgeous and I know when you put your touches on it for decorating it will be fabulous. No house is really totally right, I guess you have to weigh your options and pick your battles. You are going to make that house just perfectly perfect, I know it! The house is gorgeous, Benita! For me it's the kitchen and open floor plan! In the winter here in Arizona is when we spend time outdoors, and thankfully very few mosquitos! 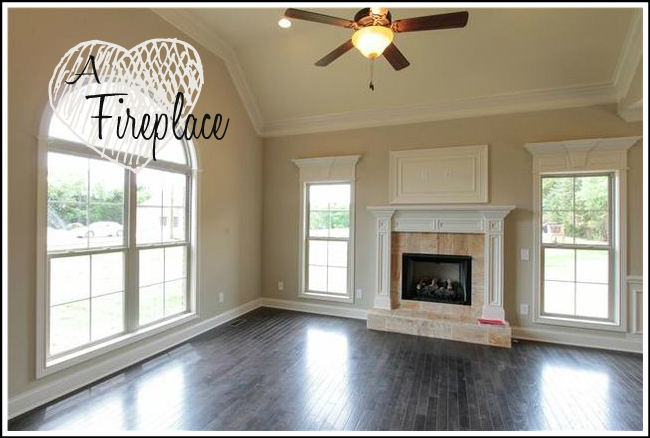 A screened porch does sound lovely! I can't wait to see how you decorate it all! Christine, thank you so much! Yes, the kitchen and open floor plan were biggies for us. And that screened in porch will be much used, as ours is now. Thank you....I'm trying to figure it all out...LOL. Hugs!! I like it and I can not wait to see how you decorate. Screen Porch!! Fun times ahead. :-) I love screen porches. Can't wait for you to move in and do some projects! Does your stick have a home yet? I would keep the ceiling fan - love the air. Save the chandelier for somewhere spectacular. A screened porch is a must - something I have missed in this house for years. You've seen my projects, right??! :-) I will get help. No, no home for the sticks yet. I will definitely be changing out the dining room chandelier and wanted to have a matching set by removing the ceiling fan. The hubster dead set on that fan though. We are now afraid the closing may be put off due to the inspecting being postponed by the builder...frustrating! That porch was a biggie for us and we are looking forward to it. We love the one in the rental and didn't want to be without it again. Its a great place with a lovely interior and huge windows which is nice. It will look perfect once you move in and actually make it your own. Greetings and best wishes! Thank you so much! I'm looking forward to getting started, hopefully we can close soon! And thank you for visiting the blog! I hope you will visit again soon! Have a great day! I remember crying along with our son when his first hermit crab died. We wished we had taken him to the vet when he stopped eating. And like the hermit crabs you certainly tried enough on for a good fit, and I know you've found it! Your home, but I don't want to think about you moving again some day. No, change your mind, retire, stay here! Pretty please with sugar on it! 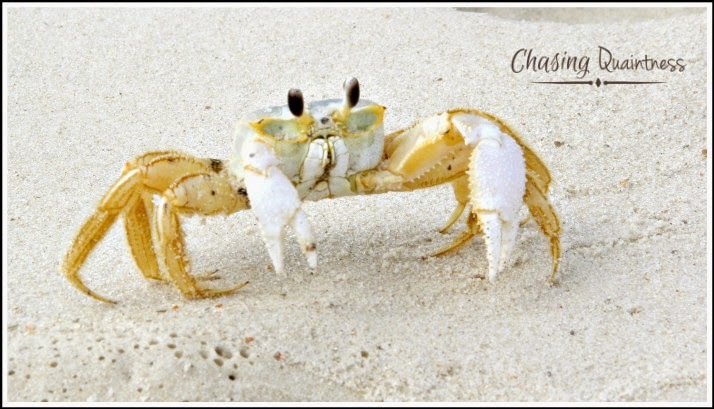 Awww, poor little crab. 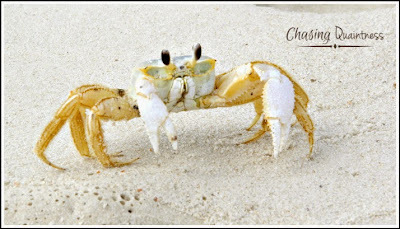 Gia found so many at the beach this week, she was just enthralled! The hubster has been thinking he might want to stay here so that we don't have to move to another city/state again...so we may be staying put for a while! :-) I would like to stay long enough to have new friends more than just a year or two, especially when I've met someone as lovely and loving as you Dewena!! Hugs!! Thank you so much Rue! We are looking forward to getting in and getting settled. I love your home, it is perfectly you and is so charming, lovely, interesting and has so much history. The bad thing about buying new is that there is no charm, no history, or no architectural details that set it apart from 5 million other homes across the US. But the older homes here that had of all those wonderful things were priced way beyond what we could pay. We will add as much to this one as we can to make it quaint and cozy for us. Hugs!! I really think the style of this home suit's you. The "heartbreaker" I think was so appealing because it was decorated like something right out of a magazine . As with Tessa, the first thing I noticed was the square two story addition,it didn't mesh. HA HA....yes, we have housewarming parties with lots of gifts and food! I would love for you to come down and after all the driving we've done this week, the 13 hours would be a snap! LOL I hope we can add a few special touches to this home to give it a little more character and have it more charming for the next owner! Happy Friday! HUGS!!! we had the same problem a few years back. the house was for rent and not to buy. but otherwise it was the same. we fell in love with one that simply didn't work, no matter how hard we tried. and it was tricky to feel the same enthusiasm for the place we ended up renting. I know what you mean! While we do love this house, it is not the same as with the house we saw first. But we are excited and are hoping that we can get the closing taken care of so we can start making this home into something we love! I love your new house, a lot! I love that it is new but that it looks old with all of the details inside! I know what you are saying about wanting white cabinets...when we bought this 'ol house the only renovation the previous owners did was to the kitchen, with solid wood nice cabinets...and as much as I wanted white I was not about to paint the wood...and I have learnt to love these cabinets! And like you we move every few years...so you have to think of resale when you buy and you don't want to break the bank doing renovations - because you won't get all that money back - and you have to appeal to the masses with your decorating - so it's a hard balance. 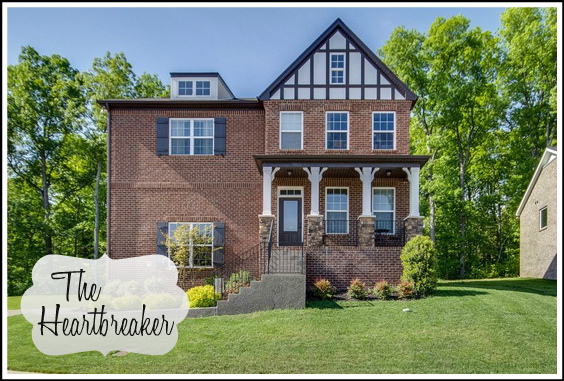 I can't wait to see what you do and especially the screened porch! Kimberley, you are so right! It is a very difficult balance when buying a house these days. I'm not sure what the market is like everywhere else, but here in Nashville, it is a seller's market and there is not a lot of room for negotiations nor to buy something that another person wouldn't want in a few years. 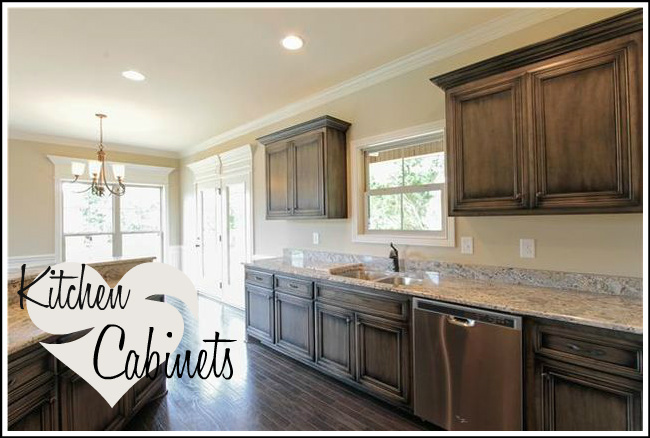 White kitchens are so pretty and are so light and bright, but when you have pretty cabinets, it is very difficult to make any changes to them. LOL...I like your idea about the fan/chandelier exchange. I'm still working on the hubby for the change! :-) Have a wonderful day and weekend!! Hugs! !